As we discovered again this week, President Obama, like his two predecessors, supports imprisoning people for making the same choices he made. By jamming up the White House’s “Open for Questions” website with votes for questions about their favorite substance, advocates for the legalization of marijuana managed to force President Obama to address the issue. This is success in Washington, even when the president chuckled derisively and came down against legalization. Of the thousands of issues in the competitive policy environment, only a few get this kind of attention. Some think the economic crisis will help the legalization cause. California state legislator Tom Ammiano argues that marijuana, by far the most lucrative crop with an estimated $14 billion in sales, could provide over a billion dollars of tax revenue in California alone. There are, however, a few problems with these numbers. First, it is always tough to estimate what total sales are for any illegal substance. Good data just doesn’t exist in this area. Second, even if $14 billion is accurate, that’s the California sales total when pot is illegal. When a pothead scores a dimebag in Los Angeles, the high price is mostly a function of the illegality. He’s paying for the risks taken by the grower, the importers, and the dealers at each step of the marijuana process. 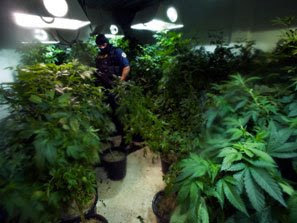 It is also possible, though, that legalization would result in a surge in demand, since potential users who avoided it due to fear of incarceration or its high price might now indulge. Advocates of decriminalization or legalization have reason to take cheer from many recent developments. Tax revenues, although not as high as some dreamers would wish, would certainly be substantial, and would replace the billions spent interdicting and confiscating marijuana, as well as imprisoning users and small time dealers. Legalizing marijuana would immediately remove millions of dollars in income from the international drug cartels that are making life hell in Mexico. The tide of public opinion is slowly moving towards decriminalization. As polling expert Nate Silver recently pointed out, only 10% supported legalization in 1969, while at least 40% do so today. The younger you are, the more likely you are to have tried marijuana, and to support its legalization. NORML doesn’t have to persuade anyone to win; if they just wait for the anti-pot geezers to die, most Americans will favor legalization within a decade. I don’t use pot, but I do believe that the tide of history is moving against our ridiculous and counterproductive ban on this relatively harmless substance. The question is not will we decriminalize, but when?